Located in the picturesque villiage of Cayuga, Ontario, Twisted Lemon is described as a hidden gem, which attracts a faithful following of flavour junkies and experienced diners from far and wide. 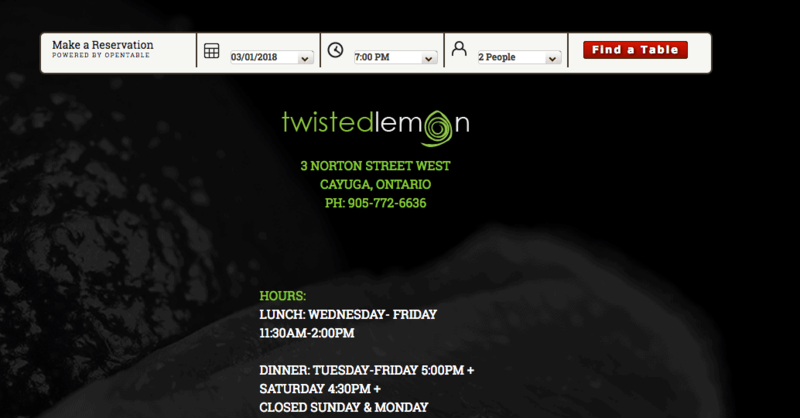 We created a custom parallax website for Twisted Lemon that includes many features including: integration of a gallery system, a form for catering, access to the entire Twisted Lemon menu online, as well as a news and events section. Mostly we really wanted to showcase the delicious gourmet food! Twisted Lemon utilizes Open Table as their reservation system. We integrated this into their website, so that patrons can make a reservation right from the homepage.